"VW" redirects here. For other uses, see VW (disambiguation). This article is about Volkswagen Passenger Cars. For the parent group, see Volkswagen Group. For Volkswagen vans, trucks and buses, see Volkswagen Commercial Vehicles. Volkswagen (German: [ˈfɔlksˌvaːɡn̩] ( listen)); English: /ˈvoʊks-, ˈvɒlksˌwɑː-, ˌwæɡən, ˈfɒlksˌvɑːɡən/); shortened to VW (German: [ˈfaʊ̯ˈveː]), is a German automaker founded on 28 May 1937 by the German Labour Front, and headquartered in Wolfsburg. It is the flagship marque of the Volkswagen Group, the largest automaker by worldwide sales in 2016 and 2017. The group's main market is in China, which delivers 40% of its sales and profits. Volkswagen translates to "people's car" in German. The company's current international advertising slogan is just "Volkswagen", referencing the name's meaning. Volkswagen was established in 1937 by the German Labour Front (Deutsche Arbeitsfront) in Berlin. In the early 1930s cars were a luxury: most Germans could afford nothing more elaborate than a motorcycle. Only one German out of 50 owned a car. Seeking a potential new market, some car makers began independent "people's car" projects – the Mercedes 170H, Adler AutoBahn, Steyr 55, and Hanomag 1.3L, among others. The trend was not new, as Béla Barényi is credited with having conceived the basic design in the mid-1920s. Josef Ganz developed the Standard Superior (going as far as advertising it as the "German Volkswagen"). In Germany, the company Hanomag mass-produced the 2/10 PS "Kommissbrot", a small, cheap rear-engined car, from 1925 to 1928. Also, in Czechoslovakia, the Hans Ledwinka's penned Tatra T77, a very popular car amongst the German elite, was becoming smaller and more affordable at each revision. Ferdinand Porsche, a well-known designer for high-end vehicles and race cars, had been trying for years to get a manufacturer interested in a small car suitable for a family. He built a car named the "Volksauto" from the ground up in 1933, using many popular ideas and several of his own, putting together a car with an air-cooled rear engine, torsion bar suspension, and a "beetle" shape, the front hood rounded for better aerodynamics (necessary as it had a small engine). In 1934, with many of the above projects still in development or early stages of production, Adolf Hitler became involved, ordering the production of a basic vehicle capable of transporting two adults and three children at 100 km/h (62 mph). He wanted all German citizens to have access to cars. The "People's Car" would be available to citizens of the Third Reich through a savings plan at 990 Reichsmarks (equivalent to €3,747 in 2009)—about the price of a small motorcycle (the average income being around 32 RM a week). Prototypes of the car called the "KdF-Wagen" (German: Kraft durch Freude – "Strength through Joy"), appeared from 1938 onwards (the first cars had been produced in Stuttgart). 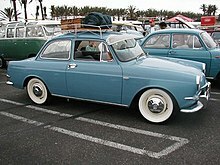 The car already had its distinctive round shape and air-cooled, flat-four, rear-mounted engine. The VW car was just one of many KdF programs, which included things such as tours and outings. The prefix Volks— ("People's") was not just applied to cars, but also to other products in Germany; the "Volksempfänger" radio receiver for instance. On 28 May 1937, Gesellschaft zur Vorbereitung des Deutschen Volkswagens mbH ("Company for the Preparation of the German Volkswagen Ltd."), or Gezuvor for short, was established by the Deutsche Arbeitsfront in Berlin. More than a year later, on 16 September 1938, it was renamed to Volkswagenwerk GmbH. The company owes its post-war existence largely to one man, wartime British Army officer Major Ivan Hirst, REME. In April 1945, KdF-Stadt and its heavily bombed factory were captured by the Americans, and subsequently handed over to the British, within whose occupation zone the town and factory fell. The factories were placed under the control of Saddleworth-born Hirst, by then a civilian Military Governor with the occupying forces. At first, one plan was to use it for military vehicle maintenance, and possibly dismantle and ship it to Britain. Since it had been used for military production, (though not of KdF-Wagens) and had been in Hirst's words, a "political animal" rather than a commercial enterprise – technically making it liable for destruction under the terms of the Potsdam Agreement – the equipment could have been salvaged as war reparations. Allied dismantling policy changed in late 1946 to mid-1947, though heavy industry continued to be dismantled until 1951. In 1986, Hirst explained how it was commonly misunderstood that he had run Wolfsburg as a British Army major. The defeated German staff, he said, were initially sullen and unresponsive, having been conditioned by many years of Nazism and they were sometimes unresponsive to orders. At Nordhoff's suggestion, he sent back to England for his officer's uniform and from then on, had no difficulty in having his instructions followed. Hirst can be seen photographed at Wolfsburg in his uniform, although he was not actually a soldier at the time but a civilian member of the military government. The title of 'Major' was sometimes used by someone who had left the Army as a courtesy, but Hirst chose not to do so. From 1948, Volkswagen became an important element, symbolically and economically, of West German regeneration. [according to whom?] Heinrich Nordhoff (1899–1968), a former senior manager at Opel who had overseen civilian and military vehicle production in the 1930s and 1940s, was recruited to run the factory in 1948. In 1949, Major Hirst left the company—now re-formed as a trust controlled by the West German government and government of the State of Lower Saxony. The "Beetle" sedan or "peoples' car" Volkswagen is the Type 1. Apart from the introduction of the Volkswagen Type 2 commercial vehicle (van, pick-up and camper), and the VW Karmann Ghia sports car, Nordhoff pursued the one-model policy until shortly before his death in 1968. By 1955, sales were on a basis that warranted the building of the Volkswagen plant on a 32-acre (13 ha) site on Scarboro's Golden Mile. To this, a 60,000-square-foot (5,600 m2) building with administration, showrooms, service, repairs and parts was built in 1957, with storage for $4,000,000 of parts. Sales soared, throughout the 1960s, peaking at the end of the decade, thanks in part to the famous advertising campaigns by New York advertising agency Doyle, Dane Bernbach. Led by art director Helmut Krone, and copywriters Julian Koenig and Bob Levinson, Volkswagen advertisements became[when?] as popular as the car, using crisp layouts and witty copy to lure the younger, sophisticated consumers with whom the car became associated. 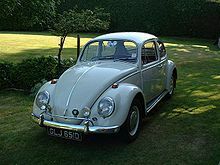 Even though it was almost universally known as the Beetle (or the Bug), it was never officially labelled as such by the manufacturer, instead referred to as the Type 1. VW expanded its product line in 1961 with the introduction of four Type 3 models (Karmann Ghia, Notchback, Fastback, and Variant) based on the new Type 3 mechanical underpinnings. The name 'Squareback' was used in the United States for the Variant. Volkswagen added a "Super Beetle" (the Type 131) to its lineup in 1971. The Type 131 differed from the standard Beetle in its use of a MacPherson strut front suspension instead of the usual torsion bars. 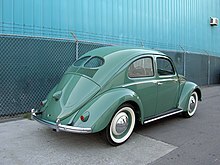 The Super Beetle featured a new hooded, padded dash and curved windshield (from 1973 model year on up). Rack and pinion steering replaced recirculating ball steering gears in model year 1975 and up. The front of the car was stretched 2 inches (51 mm) to allow the spare tire to lie flat, and the combination of these two features increased the usable front luggage space. By late 1972, Volkswagen had decided to cancel the nearly finished typ 266, a project for a mid-engined car to replace the Beetle, and to focus on front-wheel-drive, water-cooled cars. Rudolf Leiding, recently made head of Volkswagen, cited noise, heat, and servicing problems with the mid-engine layout, as well as the difficulty of making it a station wagon. Volkswagen was in serious trouble by 1973. The Type 3 and Type 4 models had sold in much smaller numbers than the Beetle and the NSU-based K70 also failed to woo buyers. Beetle sales had started to decline rapidly in European and North American markets. The company knew that Beetle production had to end, but faced a conundrum of how to replace it. VW's ownership of Audi/Auto Union proved beneficial. Its expertise in front-wheel drive, and water-cooled engines would help Volkswagen produce a credible Beetle successor. Audi influences paved the way for this new generation of Volkswagens: the Passat, Scirocco, Golf, and Polo. 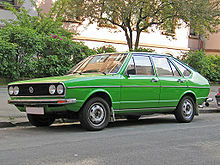 The pivotal model emerged as the Volkswagen Golf in 1974, marketed in the United States and Canada as the Rabbit for the 1st generation (1975–1985) and 5th generation (2006–2009). Its angular styling was designed by the Italian Giorgetto Giugiaro). Its design followed trends for small family cars set by the 1959 Mini – the Golf had a transversely mounted, water-cooled engine in the front, driving the front wheels, and had a hatchback, a format that has dominated the market segment ever since. Beetle production at Wolfsburg ended upon the Golf's introduction. It continued in smaller numbers at other German factories (Hanover and Emden) until 1978, but mainstream production shifted to Brazil and Mexico. While Volkswagen's range of cars soon became similar to that of other large European automakers, the Golf has been the mainstay of the Volkswagen lineup since its introduction,[when?] and the mechanical basis for several other cars of the company. There have been seven generations of the Volkswagen Golf, the first of which was produced from the summer of 1974 until the autumn of 1983 (sold as the Rabbit in the United States and Canada and as the Caribe in Latin America). Its chassis also spawned the Volkswagen Scirocco sport coupe, Volkswagen Jetta saloon/sedan, Volkswagen Golf Cabriolet convertible, and Volkswagen Caddy pick-up. North American production of the Rabbit commenced at the Volkswagen Westmoreland Assembly Plant near New Stanton, Pennsylvania in 1978. It would be produced in the United States as the Rabbit until the spring of 1984.The second-generation Golf hatchback/Jetta sedan ran from October 1983 until the autumn of 1991, and a North American version produced at Westmoreland Assembly went on sale at the start of the 1985 model year. The production numbers of the first-generation Golf has continued to grow annually in South Africa as the Citi Golf, with only minor modifications to the interior, engine and chassis, using tooling relocated from the New Stanton, Pennsylvania plant when that site began to build the Second Generation car. In the 1980s, Volkswagen's sales in the United States and Canada fell dramatically, despite the success of models like the Golf elsewhere. The Japanese and the Americans were able to compete with similar products at lower prices. Sales in the United States were 293,595 in 1980, but by 1984 they were down to 177,709. The introduction of the second-generation Golf, GTI and Jetta models helped Volkswagen briefly in North America. Motor Trend named the GTI its Car of the Year for 1985, and Volkswagen rose in the J.D. Power buyer satisfaction ratings to eighth place in 1985, up from 22nd a year earlier. VW's American sales broke 200,000 in 1985 and 1986 before resuming the downward trend from earlier in the decade. Chairman Carl Hahn decided to expand the company elsewhere (mostly in developing countries), and the New Stanton, Pennsylvania factory closed on 14 July 1988. Meanwhile, four years after signing a cooperation agreement with the Spanish car maker SEAT in 1982, Hahn expanded the company by purchasing a majority share of SEAT up to 75% by the end of 1986, which VW bought outright in 1990. On 4 July 1985, Volkswagenwerk AG was renamed to Volkswagen AG. In 1983 the MK2 Golf was launched. At the beginning of 1988, the third generation Passat was the next major car launch and Volkswagen did not produce a hatchback version of this Passat, despite the rising popularity of the hatchback bodystyle throughout Europe. Just after launching the B3 Passat, Volkswagen launched the Corrado, replacement for the Scirocco, although the Scirocco remained in production until 1992. In 1991, Volkswagen launched the third-generation Golf, which was European Car of the Year for 1992. The Golf Mk3 and Jetta arrived in North America in 1993. The sedan version of the Golf was badged Vento in Europe, but remained Jetta in the United States. The Scirocco and the later Corrado were both Golf-based coupés. The company's evolution of its model range was continued with the Golf Mk4, introduced at the end of 1997 (North America in 1999), its chassis spawned a host of other cars within the Volkswagen Group; the Volkswagen Bora (the sedan known as the Jetta in the United States), SEAT Toledo, SEAT León, Audi A3, Audi TT, and Škoda Octavia. Other main models during the decade include the Polo, a smaller car than the Golf, and the larger Passat for the segment above the Golf. Volkswagen began introducing an array of new models after Bernd Pischetsrieder became Volkswagen Group CEO (responsible for all Group brands) in 2002. The sixth-generation VW Golf was launched in 2008, came runner-up to the Opel/Vauxhall Insignia in the 2009 European Car of the Year, and has spawned several cousins: VW Jetta, VW Scirocco, SEAT León, SEAT Toledo, Škoda Octavia and Audi A3 hatchback ranges, as well as a new mini-MPV, the SEAT Altea. The GTI, a "hot hatch" performance version of the Golf, boasts a 2.0 L Turbocharged Fuel Stratified Injection (FSI) direct injection engine. VW began marketing the Golf under the Rabbit name once again in the U.S. and Canada in 2006. The sixth-generation Passat and the fifth-generation Jetta both debuted in 2005, and Volkswagen announced plans to expand its lineup further by bringing back the Scirocco by 2008. Other models in Wolfgang Bernhard's (Volkswagen brand CEO) "product offensive" include the Tiguan mid-sized SUV in 2008 and a Passat Coupé. In November 2006 Bernd Pischetsrieder announced his resignation as Volkswagen Group CEO, and was replaced by Audi worldwide CEO Martin Winterkorn at the beginning of 2007. Volkswagen in 2005 maintained North American sales of 224,195. Momentum continued for fiscal 2006, as Volkswagen's North American sales for the year were 235,140 vehicles, a 4.9 percent increase over 2005, despite a slump in domestic North American manufacturer's sales. In conjunction with the introduction of new models, production location of Volkswagen vehicles also underwent great change. The 2007 Eos, a hardtop convertible, is produced in a new facility in Portugal. All Golfs/Rabbits and GTIs as of 2006 are manufactured in Wolfsburg, Germany, rather than Puebla, Mexico, where Golfs and GTIs for the North American market were produced from 1989 to 1998, and the Brazilian factory in Curitiba, where Golfs and GTIs were produced from 1999 to 2006 (the Jetta has been primarily manufactured in Mexico since 1989). Volkswagen is also in the process of reconfiguring an automotive assembly plant in Belgium. The new models and investments in manufacturing improvements were immediately noticed by automotive critics. 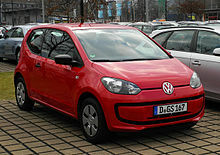 Favorable reviews for Volkswagen's newest cars include the GTI being named by Consumer Reports as the top sporty car under $25,000, one of Car and Driver magazine's "10 Best" for 2007, Automobile Magazine's 2007 Car of the Year, as well as a 2008 Motor Trend comparison ranking the mid-size Passat first in its class. Volkswagen partnered with Daimler AG and other companies to market the BlueTec clean diesel technology on cars and trucks from Mercedes-Benz, Volkswagen, and other companies and brands. According to the United States Environmental Protection Agency, four of the ten most fuel-efficient vehicles available for sale in the United States are powered by Volkswagen diesel engines. Volkswagen has offered a number of its vehicles with a TDI (Turbocharged Direct Injection) engine, which lends class-leading fuel economy to several models. They were a three-way tie for 8th (TDI Beetle, TDI Golf, TDI Jetta) and ninth, the TDI Jetta Wagon. In addition, all Volkswagen TDI diesel engines produced from 1996 to 2006 can be driven on 100% biodiesel fuel. For the 2007 model year, however, strict U.S. government emissions regulations have forced Volkswagen to drop most diesels from their U.S. engine lineup, but a new lineup of diesel engines (then thought) compatible to U.S. standards returned to the American market starting with Model Year 2009. These post-2009 Clean Diesel engines are limited to running on 5% (B5) biodiesel only to maintain Volkswagen's warranty. Volkswagen long resisted adding a SUV to its lineup, but relented with the introduction of the Touareg, made in partnership with Porsche, while they worked on the Porsche Cayenne and later the Audi Q7. Though acclaimed as a fine handling vehicle, the Touareg has been a modest seller at best, and it has been criticised by auto reviewers for its absence of a third-row seat, the relatively poor fuel economy, and the high vehicle mass. Volkswagen set plans to add a compact SUV with styling influences from the "Concept A" concept vehicle introduced at the 2006 Geneva Auto Show, and on 20 July 2006, Volkswagen announced that the new vehicle, called the Tiguan. Since the discontinuance of the T4 in 2003 and decision not to export the T5 to the United States, Volkswagen, coincidentally, lacked a van for its North American lineup. To remedy this, Volkswagen launched the Volkswagen Routan, a badge-engineered Dodge Grand Caravan made for the American and Canadian markets, in 2008. In May 2011, Volkswagen completed Chattanooga Assembly in Tennessee. The facility has produced Volkswagen cars and SUVs specifically designed for North American markets, beginning with the Passat B7 in 2011. The company recently announced plans to expand further by investing $900 million to add floor space to the factory. The Volkswagen Atlas (a large crossover SUV) began production in late 2016, and aimed to help end several years of losses for Volkswagen in the United States, the world's second-largest auto market. Volkswagen is the founding and namesake member of the Volkswagen Group, a large international corporation in charge of multiple car and truck brands, including Audi, SEAT, Porsche, Lamborghini, Bentley, Bugatti, Scania, MAN, and Škoda. Volkswagen Group's global headquarters are located in Volkswagen's historic home of Wolfsburg, Germany. Volkswagen has factories in many parts of the world, manufacturing or assembling vehicles for local markets. In addition to plants in Germany, Volkswagen has manufacturing or assembly facilities in Mexico, the United States, Slovakia, China, India, Indonesia, Russia, Malaysia, Brazil, Argentina, Portugal, Spain, Poland, the Czech Republic, Bosnia and Herzegovina, Kenya and South Africa. In 2011, Volkswagen was named in the top 25 largest companies in the world by the Forbes Global 2000. Volkswagen is setting up a new factory in West Java, Indonesia, which started construction in mid-2013. The investment into the new plant, which will produce large transporters and multivans, is valued at $140 million. In January 2016, Volkswagen announced launching a new factory in Algeria during a summit between Angela Merkel and Algerian prime minister Abdelmalek Sellal.. Factory was launched during 2017 in Relizane, producing Volkswagen Golf VII, Volkswagen Polo, Volkswagen Caddy, Seat Ibiza and Skoda Octavia cars. The two companies continued their collaboration in 1969 to make the VW-Porsche 914 and Porsche 914-6. (The 914-6 had a 6-cylinder Porsche engine, and the standard 914 had a Volkswagen engine.) Volkswagen and Porsche would collaborate again in 1976 on the Porsche 912-E (USA only) and the Porsche 924, which used many Audi components and was built at Audi's Neckarsulm facilities. The 924 was originally designated for AUDI. Most Porsche 944 models were built there, although they used far fewer VW components. On 4 March 2005, the European Commission brought an action against the Federal Republic of Germany before the European Court of Justice, claiming that the Volkswagen Law, which prevents any shareholder in Volkswagen from executing more than 20% of the total voting rights in the firm, was illegally restricting the flow of capital in Europe. On 13 February 2007, Advocate General Dámaso Ruiz-Jarabo Colomer submitted an opinion to the court in support of the action. This again opened the possibility of a hostile takeover of VW and so on 26 March of the same year Porsche took its holding of Volkswagen shares to 30.9%. Porsche formally announced in a press statement that it did not intend to take over Volkswagen, but intended the move to avoid a competitor's taking a large stake and to stop hedge funds from dismantling VW. As expected, on 22 October 2007, the European Court of Justice ruled in agreement with Ruiz-Jarabo and the law was struck down. In October 2007, the European Court of Justice ruled that the VW law was illegal because it was protectionist. At that time, Porsche held 31% of VW shares – although a smaller proportion of voting rights, due to the Volkswagen Law – and there had been speculation that Porsche would be interested in taking over VW if the law did not stand in its way. The court also prevented the government from appointing Volkswagen board members. The German government then rewrote the Volkswagen law, only to be sued again. In October 2013, the EU Court of Justice in Luxembourg ruled that the rewritten Volkswagen law "complied in full" with EU rules. On 26 October 2008, Porsche revealed its plan to assume control of VW. As of that day, it held 42.6% of Volkswagen's ordinary shares and stock options on another 31.5%. Combined with the state of Lower Saxony's 20.1% stake, this left only 5.8% of shares on the market—mostly with index funds that could not legally sell. Hedge funds desperate to cover their short positions forced Volkswagen stock above one thousand euros per share, briefly making it the world's largest company by market capitalisation on 28 October 2008. By January 2009, Porsche had a 50.76% holding in Volkswagen AG, although the "Volkswagen Law" prevented it from taking control of the company. Manufactured by Shanghai Volkswagen Automotive and FAW-Volkswagen Automotive for the Chinese market. VW pure ethanol prototype car developed by Volkswagen do Brasil in 1978. Volkswagen do Brasil produced and sold pure ethanol-powered (E100 only) vehicles in Brazil, and production was discontinued only after they were supplanted by more modern Flex Fuel technology. As a response to the 1973 oil crisis, the Brazilian government began promoting bioethanol as a fuel, and the National Alcohol Program -Pró-Álcool- (Portuguese: Programa Nacional do Álcool) was launched in 1975. Compelled by the 1979 energy crisis, and after development and testing with government fleets by the CTA at São José dos Campos, and further testing of several prototypes developed by the four local carmakers, including Volkswagen do Brasil, pure ethanol vehicles were launched in the Brazilian market. Gasoline engines were modified to support hydrous ethanol characteristics and changes included compression ratio, amount of fuel injected, replacement of materials that would get corroded by the contact with ethanol, use of colder spark plugs suitable for dissipating heat due to higher flame temperatures, and an auxiliary cold-start system that injects gasoline from a small tank in the engine compartment to help starting when cold. Within six years, around 75% of all Brazilian passenger cars were manufactured with ethanol engines. Production and sales of pure ethanol vehicles tumbled beginning in 1987 owing to several factors, including a sharp decline in gasoline prices as a result of the 1980s oil glut, and high sugar prices in the world market, shifting sugarcane ethanol production from fuel to sugar. By mid-1989, a shortage of ethanol fuel supply in the local market left thousands of vehicles in line at gas stations or out of fuel in their garages, forcing consumers to abandon ethanol vehicles. Volkswagen and Sanyo have teamed up to develop a battery system for hybrid cars. Volkswagen head Martin Winterkorn has confirmed the company plans to build compact hybrid electric vehicles. He has stated "There will definitely be compact hybrid models, such as Polo and Golf, and without any great delay", with gasoline and diesel power. For example, Golf is the ideal model to go hybrid as the Golf 1.4 TSI was recently awarded the "Auto Environment Certificate" by the Oko-Trend Institute for Environmental Research, and was considered as one of the most environmentally friendly vehicles of 2007. Also underway at Volkswagen's Braunschweig R&D facilities in Northern Germany is a hybrid version of the next-generation Touareg. In November 2009, Volkswagen announced it has hired Karl-Thomas Neumann as its group chief officer for electric traction. VW's Chief of research, Jürgen Leohold, said in 2010 the company has concluded hydrogen fuel-cell cars are not a viable option. As of May 2016[update], the Volkswagen Group offers for retails customers nine plug-in electric cars, of which, three are all-electric cars: the Volkswagen e-Up!, e-Golf and Audi R8 e-tron, and six are plug-in hybrids: the Volkswagen Golf GTE, Passat GTE, Audi A3 Sportback e-tron, Q7 e-tron quattro, Porsche Panamera S E-Hybrid and Cayenne S E-Hybrid. Also two limited production plug-in hybrids were manufactured beginning in 2013, the Volkswagen XL1 (250 units) and the Porsche 918 Spyder (918 units). Total cumulative sales of all Volkswagen brand electrified cars since the start of their respective production is expected to reach about 103,000 by the end of 2016. In order to comply with increasingly strict carbon dioxide emission limits in major markets, the VW Group expects to sell about one million all-electric and plug-in hybrid vehicles a year worldwide by 2025. The Group plans to expand its plug-in range with 20 new pure electric and plug-in hybrid cars, including two cars to compete with Tesla Motors, the Porsche Mission E all-electric car and the Audi e-tron quattro, which is expected to become the brand's first mass production electric vehicle. According to Thomas Ulbrich, VW brand production chief, the carmaker has capacitty to build as many as 75,000 battery electric and plug-in hybrids a year if demand rises. Volkswagen announced in October 2015 that "it will develop a modular architecture for battery electric cars, called the MEB. The standardized system will be designed for all body structures and vehicle types and will allow the company to build emotionally appealing EVs with a range of up to 310 mi (500 km)." In June 2016, VW launched a program to develop 30 all-electric cars in 10 years, and sell 2–3 million electric cars per year by 2025. Due to lower manpower requirements for electric motors than for piston engines, VW expects a gradual workforce reduction as numbers of electric cars increase. VW considers battery factory ownership as too expensive. In 1996, Volkswagen first implemented its seven environmental goals in Technical Development with themes involving climate protection, resource conservation, and healthcare, through objectives such as reducing greenhouse emissions and fuel consumption, enabling alternative fuels, and avoiding hazardous materials. The goals have been revised in 2002 and 2007. Volkswagen was the first car manufacturer to apply ISO 14000, during its drafting stage and was re-certified under the standards in September 2005. In 2011, Greenpeace began criticising Volkswagen's opposition to legislation requiring tighter controls on CO2 emissions and energy efficiency, and launched an advertising campaign parodying VW's series of Star Wars-based commercials. In 2013, the Volkswagen XL1 became the most fuel-efficient production car in the world, with a claimed combined fuel consumption of 261 mpg (0.90-liter/100 km). Driving style has huge impact on this result – "normal" driving produces mileage in the 120 mpg range (1.96-liter/100 km). As of 2014[update], VW is registered with a Corporate Average Fuel Economy (CAFE) of 34-38 mpg in the United States. In May 2014, the EPA was first alerted to the issue by the International Council on Clean Transportation (ICCT), reporting results of research commissioned for them by West Virginia University's Center for Alternative Fuels, Engines and Emissions (CAFEE). After 15 months of denying the emissions control systems were deliberately gamed and instead claiming discrepancies due to "technical" reasons, on 21 August Volkswagen acknowledged to the EPA and California Air Resources Board (CARB) their emission controls systems were rigged. This was followed by a formal announcement of admission to regulators on 3 September which took place immediately after the EPA threatened to withhold approval for their 2016 cars. Volkswagen's initial public response came on 20 September, when a spokesman said they would stop all US sales of the diesel models affected. Chairman Martin Winterkorn issued an apology and said Volkswagen would cooperate with investigators. Since emission standards in Canada are close to those in the US, Volkswagen Canada also halted sales of the affected diesel models. on 22 September 2015, Volkswagen spokesman admitted that the defeat device is installed in ~11 million vehicles with Type EA 189 diesel engines worldwide. On the first business day after the news, Volkswagen's stock price declined 20% and declined another 17% the following day, the same day a social media advertisement with Wired about "how diesel was re-engineered" was removed as well as a series of YouTube ads titled "Diesel Old Wives’ Tales". On Wednesday, 23 September, Volkswagen chief executive officer Martin Winterkorn resigned. Volkswagen hired Kirkland & Ellis law firm for defense, the same firm that defended BP during the Deepwater Horizon oil spill. On 2 November 2016, the EPA issued a second notice of violation (NOV) pertaining to certain diesel 3.0-liter V6 equipped Audis, Volkswagen Touaregs and Porsche Cayennes. The EPA found beginning with the 2009 model year all vehicles powered by the V6 were non-compliant. During testing the EPA, CARB and Transport Canada discovered software that activates pollution reduction systems when the automobiles are being driven under federal test conditions, otherwise during real world driving these devices are inactive. Volkswagen disputed the EPA's findings stating their software was legally permitted, however shortly after Volkswagen issued a stop-sale for the EPA's disputed vehicles and additional models the EPA did not question. In March 2016, the US Federal Trade Commission sued Volkswagen for false advertising, because Volkswagen's "clean diesel" vehicles were less environmentally friendly than advertised. 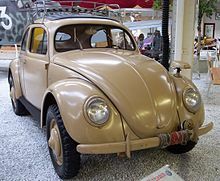 Volkswagen was named the fourth most influential car of the 20th century in the 1999 Car of the Century competition, for its Volkswagen Type 1 'Beetle" model. It trailed only the Ford Model T, BMC Mini, and Citroën DS. Volkswagen has produced five winners of the United States Motor Trend Car of the Year award – the original Car of the Year designation, which began in 1949. In July 2011 Wolfgang Dürheimer, the director of Bugatti and Bentley, told German magazine Auto, Motor und Sport that "if [the VW group] is at the forefront of the auto industry, I can imagine us competing in Formula 1 in 2018. We have enough brands to pull it off." They did not compete in F1 in 2018. In 1981, now based in Hanover, VW took a new direction into rallying, with the launch of the first-generation Golf, and Sweden's Per Eklund, Frenchman Jean-Luc Thérier, and the Finn Pentti Airikkala. The final chapters in Volkswagen Racing UK's rallying story were the 'one-make' Castrol Polo Challenge, and the Polo GTI 'Super 1600' in 2001. Volkswagen Motorsport won the World Rally Championship with Sébastien Ogier and co-driver Julien Ingrassia four years in a row from 2013 to 2016 in the Volkswagen Polo R WRC. In 2005, an updated Race-Touareg with slightly more power entered, with driver Bruno Saby finishing 3rd overall and 1st in the Diesel class. In 2006, the revised Race-Touareg entered, with driver Giniel de Villiers finishing 2nd overall and 1st in the Diesel class. Volkswagen won the 2009, 2010 and 2011 Dakar Rally, held in South America. Europe: In 1998 the company founded the ADAC Volkswagen Lupo Cup, founded in 1998 (renamed Polo Cup in 2003, and Volkswagen Scirocco R-Cup from 2010 to 2014), and started the ADAC New Beetle Cup in 2000. In 2004, Volkswagen Commercial Vehicles entered the European Truck Racing series with the Volkswagen Titan truck – it became a back-to-back champion for the 2004 and 2005 series. United States: In 1976, Volkswagen entered the under-2000-cc Trans-Am Series, with the Scirocco, and they won their class outright. Beginning in 2008 Volkswagen introduced the Jetta TDI Cup. The Jetta TDI Cup is a SCCA sanctioned race series that features 25 drivers between the ages of 16 and 26 driving slightly modified 2009 Jetta TDIs. The series features 10 events at 8 different road courses across North America. There is $50,000 prize money at stake over the course of the series in addition to the $100,000 prize awarded to the champion of the series at the conclusion of the last race. Austria: From 1967 until 1974, the Austrian sole distributor Porsche Salzburg entered the VW Beetle (1500, 1302S and 1303S) in Europe-wide rallies. Victories were achieved in 1972 and 1973 in the overall Austrian championship, on Elba, in the Acropolis rally (first in class). Top drivers were Tony Fall (GB), Achim Warmbold (D), Günter Janger (A), Harry Källström(S). Standard Superior – a previous attempt to produce a "Volkswagen"
^ Bomey, Nathan (30 January 2017). "Volkswagen passes Toyota as world's largest automaker despite scandal". USA Today. Retrieved 20 June 2017. ^ "China car sales slump ripples globally". BBC News. 12 October 2018. ^ "Economic Superpower: Chinese Expansion Has Germany on the Defensive". Spiegel Online. 24 May 2018. ^ Rodriguez, Ashley (23 December 2015). "'Das Auto' No More – Volkswagen's new slogan is a lesson in humility". Quartz. Retrieved 13 January 2016. ^ Cremer, Andreas (22 December 2015). "'Das Auto' no more: Volkswagen plans image offensive". Berlin. Reuters. Retrieved 13 January 2016. ^ Manfred Grieger; Ulrike Gutzmann; Dirk Schlinkert, eds. (2008). Volkswagen Chronicle (PDF). Historical Notes. 7. Volkswagen AG. ISBN 978-3-935112-11-6. Archived from the original (PDF) on 16 December 2010. Retrieved 21 December 2009. ^ Miller, Elan (13 September 2009). "Was Hitler's Beetle designed by a Jew?". The Jerusalem Post. Retrieved 18 February 2013. ^ Christoph Stehr (2 February 2016). "Das machen wir mal lieber neu". Der Spiegel (in German). Retrieved 7 February 2016. ^ "Last Edition Beetle: History". Lasteditionbeetle.com. Archived from the original on 6 March 2008. Retrieved 22 September 2015. ^ * Tooze, Adam (2006). The Wages of Destruction: The Making and Breaking of the Nazi Economy. London: Allen Lane. p. 154. ISBN 978-0-7139-9566-4. ^ "Seventy-Five Years Ago: Porsche Receives the Order to Construct the Volkswagen". porsche.com. Porsche AG. 16 June 2009. Archived from the original on 23 September 2016. Retrieved 22 January 2010. ^ "A Brief History of Volkswagen". hillsideimports.com. Retrieved 10 March 2015. ^ "Volkswagen Faces Suit Over Jewish Slave Labor". The New York Times. 13 June 1998. Retrieved 18 May 2011. ^ "World: Americas German firms face slave labour case". BBC News. 1 September 1998. Retrieved 18 May 2011. ^ a b "Volkswagen Model 11 Beetle". hillsideimports.com. 20 February 2014. Retrieved 4 April 2015. ^ "Harry S. Truman – Library & Museum – Draft, The President's Economic Mission to Germany and Austria, Report 3, March, 1947; OF 950B: Economic Mission as to Food...; Truman Papers". Trumanlibrary.org. Retrieved 27 September 2010. ^ Anders Ditlev Clausager (18 March 2000). Obituaries – Ivan Hirst The Guardian(UK). ^ Colin Shinkin About the 1972 Baja Champion SE – USA Archived 28 April 2015 at the Wayback Machine (photos). SEBeetles.com. ^ Dean, Wayne (28 October 2006). "History of the Super Beetle". superbeetles.com. Retrieved 6 May 2015. ^ William Beaver (Nov–Dec 1992). Volkswagen's American assembly plant: Fahrvergnugen was not enough – international marketing Find Articles; Business Horizons. ^ Holusha, John (21 November 1987). "Volkswagen to Shut U.S. Plant". The New York Times. Retrieved 17 May 2008. ^ "A look at SEAT's time line 2008-1950". seat.com. SEAT S.A. Archived from the original on 18 July 2009. ^ "The VW Experimental Vehicles – the 1980s to present pt 2". Wheelspin. London & Thames Valley VW Club. February 2003. Archived from the original on 14 June 2011. Retrieved 12 July 2010. ^ "VW Sharan". Car Magazine. 2 June 2011. Retrieved 4 January 2015. ^ "VW launches its economic miracle". The Engineer. 5 January 2000. Retrieved 4 January 2015. ^ "Fuel Economy of New Diesel Cars". Fueleconomy.gov. United States Environmental Protection Agency. 2012. Retrieved 5 December 2012. ^ Chris Bruce (7 April 2015). "Volkswagen plans expansion, tech center in Chattanooga". Autoblog. Retrieved 22 September 2015. ^ Bloomberg News (16 July 2008). "VW picks Tenn. for its 1st US car plant since '88". Boston Globe. ^ "UPDATE: VW announces Chattanooga-made SUV, and 2,000 new jobs". timesfreepress.com. Archived from the original on 8 August 2014. Retrieved 22 September 2015. ^ By Charlie Osborne, ZDNet. "Volkswagen launches new cybersecurity firm to tackle car security." 15 September 2016. Retrieved 15 September 2016. ^ Rauwald, Christoph (11 September 2017). "VW to Build Electric Versions of All 300 Models by 2030". Bloomberg. Retrieved 11 October 2017. ^ "Volkswagen to end production of the Beetle next year". Reuters. Retrieved 14 September 2018. ^ Dorian, Drew (26 February 2019). "Jetta Becomes a Separate Brand for China to Entice Entry-Level Buyers". Car and Driver. Retrieved 26 February 2019. ^ The Editors of Encyclopaedia Britannica (2017). "Volkswagen Group". Encyclopedia Britannica. ^ Rauwald, Christoph (4 June 2012). "VW Bolsters Focus on China". The Wall Street Journal. p. B3. ^ "New Car Registrations By Manufacturer(PDF)" (PDF). ACEA. 15 June 2010. Archived from the original (PDF) on 8 August 2011. Retrieved 2 July 2010. 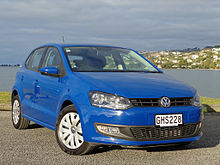 ^ "Volkswagen Posts Record 2009 Sales, Targets Toyota". Bloomberg. 12 December 2010. Retrieved 12 December 2010. ^ "VW Overtakes Ford as 3rd-Largest Automaker". Left Lane News. 29 August 2008. Retrieved 12 December 2010. ^ "World Motor Vehicle Production" (PDF). www.oica.net. Retrieved 2019-01-12. ^ "Volkswagen Group reports 6.7 percent growth in worldwide deliveries in July". VW. 12 December 2010. Archived from the original on 25 July 2011. Retrieved 12 December 2010. ^ Watson, Todd (20 August 2013). "Volkswagen to open new plant in Indonesia". Inside Investor. Retrieved 20 August 2013. ^ "The World's Biggest Public Companies". Forbes.com. Retrieved 6 June 2011. ^ "German car makers push Indonesia". Investvine.com. 28 February 2013. Retrieved 3 April 2013. ^ "Volkswagen plans engine assembly in India; to increase 90 per cent localisation". The Times of India. Retrieved 22 September 2015. ^ "Automobile : bientôt une usine Volkswagen en Algérie ?". Jeune Afrique (in French). 13 January 2016. Retrieved 23 January 2016. ^ Rzhevskiy, Ilya. "Volkswagen to Improve Work-Life Balance". The Epoch Times. Retrieved 2 January 2012. ^ Rahn, Cornelius (23 December 2011), Volkswagen Employees Wary of Burnout Win Reprieve From BlackBerry Messages, Bloomberg L.P.
^ "Porsche wants 20% Volkswagen deal | 26 September 2005". BBC News. 26 September 2005. Retrieved 27 September 2010. ^ Commission of the European Communities. "Action brought on 4 March 2005 by the Commission of the European Communities against the Federal Republic of Germany". European Court of Justice. Retrieved 13 February 2012. ^ "Top EU court finds against VW law". BBC News. 13 February 2007. Retrieved 27 September 2010. ^ "Porsche triggers VW takeover bid". BBC News. 26 March 2007. Retrieved 27 September 2010. ^ Landler, Mark (23 October 2007). "Court Strikes Down 'Volkswagen Law'". The New York Times. Germany. Retrieved 26 August 2011. ^ European Court of Justice. "Judgment of the Court (Grand Chamber) in Case C-112/05". European Court of Justice. Retrieved 13 February 2012. ^ "THE VOLKSWAGEN LAW RESTRICTS THE FREE MOVEMENT OF CAPITAL" (PDF). COURT OF JUSTICE OF THE EUROPEAN COMMUNITIES. 23 October 2007. Retrieved 17 February 2013. ^ "'Volkswagen law' is ruled illegal". BBC. 23 October 2007. Retrieved 17 February 2013. ^ "EU To Sue Germany Again Over 'Volkswagen Law'". The Wall Street Journal. 24 November 2011. Retrieved 17 February 2013. ^ Ramsey (27 November 2011). "Germany in court again over "VW Law," could face fines of nearly $375,000/day". Autoblog. Retrieved 17 February 2013. ^ "Germany sued for second time over 'Volkswagen law'". The Parliament. 25 November 2011. Retrieved 17 February 2013. ^ Bloomberg (22 October 2013). "Germany Wins EU Court Battle Over VW Law, Escapes Fines". Retrieved 5 February 2014. ^ "Financial Times | Porsche plans to raise VW stake to 75%". Financial Times. 26 October 2008. Retrieved 27 September 2010. ^ "VW vies for title of world's biggest company". Financial Times. 28 October 2008. Retrieved 27 September 2010. ^ "Porsche takes majority VW stake". BBC News. 6 January 2009. Retrieved 16 June 2010. ^ "Volkswagen to take a 42.0 percent stake in Porsche AG". Taume News. 14 August 2009. Archived from the original on 18 August 2009. Retrieved 22 January 2009. ^ "VW to buy half of Porsche by 2010". BBC News. 20 October 2009. Retrieved 20 October 2009. ^ "VW purchase Porsche Holding Salzburg (PHS)". IndustryWeek. 1 March 2011. Archived from the original on 24 March 2012. Retrieved 1 March 2011. ^ ":: Volkswagen AutoMuseum :: About us". Automuseum.volkswagen.de. Archived from the original on 15 August 2011. Retrieved 26 August 2011. ^ ":: Volkswagen AutoMuseum :: Certificate Generator". Automuseum.volkswagen.de. Archived from the original on 11 October 2011. Retrieved 26 August 2011. ^ (www.dw.com), Deutsche Welle. "Volkswagen Group achieves record sales in 2017 | DW | 17 January 2018". DW.COM. Retrieved 21 September 2018. ^ "Volkswagen delivered 10.8 million vehicles in 2018, eyes world no.1 spot". CNBC. Retrieved 2019-03-16. ^ "What the Cross Coupe GTE Concept Means for Volkswagen " Form Trends". Formtrends.com. Retrieved 22 September 2015. ^ a b "2015 Volkswagen Golf GTE". Caranddriver.com. Retrieved 22 September 2015. ^ "Electric mobility: the technology of electric cars – Volkswagen". Emobility.volkswagen.com. Archived from the original on 22 September 2015. Retrieved 22 September 2015. ^ a b c Milton Briquet Bastos (20 June 2007). "Brazil's Ethanol Program – An Insider's View". Energy Tribune. Archived from the original on 10 July 2011. Retrieved 14 August 2008. ^ a b Revista Veja (13 June 1979). "O petróleo da cana" (in Portuguese). Editora Abril. Archived from the original on 6 October 2008. Retrieved 29 November 2008. ^ a b Marla Dickerson (17 June 2005). "Brazil's ethanol effort helping lead to oil self-sufficiency". The Seattle Times. Archived from the original on 27 December 2008. Retrieved 29 November 2008. ^ William Lemos (5 February 2007). "The Brazilian ethanol model". ICIS news. Retrieved 14 August 2008. ^ Revista Veja (24 May 1989). "Um sonho corroído" (in Portuguese). Editora Abril. Archived from the original on 8 February 2009. Retrieved 29 November 2008. ^ a b "Volkswagen to stop making gas-only cars for Brazil". Automotive News. 23 March 2006. Archived from the original on 13 February 2009. Retrieved 18 October 2008. ^ "A Nova Volkswagen" (in Portuguese). Volkswagen do Brasil. Archived from the original on 15 September 2008. Retrieved 18 October 2008. ^ "Volkswagen lança Golf Total Flex 1.6" (in Portuguese). ParanaOnline. 30 March 2006. Retrieved 18 October 2008. ^ "Tabela 08 – Vendas Atacado Mercado Interno por Tipo e Empresa – Combustível Flex Fuel – 2005" (PDF) (in Portuguese). ANFAVEA – Associação Nacional dos Fabricantes de Veículos Automotores (Brazil). Retrieved 16 April 2009. See Table 08 for flex-fuel sales and Table 07 for gasoline sales. ^ "Tabela 08 – Vendas Atacado Mercado Interno por Tipo e Empresa – Combustível Flex Fuel – 2007" (PDF) (in Portuguese). ANFAVEA – Associação Nacional dos Fabricantes de Veículos Automotores (Brazil). Retrieved 16 April 2009. See Table 08 for flex-fuel sales and Table 07 for gasoline sales. ^ "Tabela 08 – Vendas Atacado Mercado Interno por Tipo e Empresa – Combustível Flex Fuel – 2008" (PDF) (in Portuguese). ANFAVEA – Associação Nacional dos Fabricantes de Veículos Automotores (Brazil). Retrieved 16 April 2009. See Table 08. ^ "VW: dois milhões de carros flex" (in Portuguese). Auto Brasil. 25 March 2009. Retrieved 19 April 2009. ^ "Volkswagen atinge 2 milhões de carros Flex produzidos no Brasil" (in Portuguese). Noticias Automotivas. 24 March 2009. Archived from the original on 6 September 2012. Retrieved 18 April 2009. ^ "Volkswagen and Sanyo Team Up To Develop Hybrid Battery Systems". Theautochannel.com. Retrieved 27 September 2010. ^ ""Volkswagen Hybrid: Runaway Winner". Eco-Friendly Hybrid Cars, 2 May 2008". Green-hybrid-cars.com. Archived from the original on 6 March 2009. Retrieved 27 September 2010. ^ "Compact Hybrid Coming From Volkswagen". Edmunds.com. 22 January 2009. Archived from the original on 17 February 2009. Retrieved 27 September 2010. ^ "2007 Frankfurt Auto Show: Volkswagen Up!". Edmunds.com. 11 September 2007. Archived from the original on 1 March 2009. Retrieved 27 September 2010. ^ "Report: All Volkswagen models to have hybrid option". eGMCarTech. 24 September 2007. Retrieved 27 September 2010. ^ Nick Kurczewski (5 March 2010). "Geneva Auto Show: 2011 VW Touareg and 2012 Touareg Hybrid". The New York Times. Retrieved 26 March 2010. ^ Scott Evans (March 2010). "First Drive: 2011 Volkswagen Touareg". Motor Trend. Retrieved 26 March 2010. ^ "VW to launch hybrid Jetta in 2012". Parker's. Archived from the original on 14 January 2013. Retrieved 26 March 2010. ^ Motor Authority (17 March 2010). "VW To Focus on Several Electric and Hybrid Vehicle Launches Including Golf, Jetta, Passat and More". All Cars Electric. Retrieved 26 March 2010. ^ "Volkswagen Hires New Electric Vehicle Chief – Automotive News & Car Rumors at Automobile Magazine". Rumors.automobilemag.com. 12 November 2009. Retrieved 22 December 2009. ^ "Audi's PHEV Concept; Volkswagen Research Chief Criticizes Fuel Cells". Calcars.org. Retrieved 27 September 2010. ^ "Fuel cell cars won't save the world". Autocar. 6 November 2007. Retrieved 27 September 2010. ^ a b c Hetzner, Christiaan (29 May 2016). "VW goal: 1 million electrified vehicles by 2025". Automotive News. Retrieved 29 May 2016. ^ Henning Kroghhkrogh (9 October 2013). "Vergabe der Kleinstserie: VW lenkt XL-1-Fans auf Zielgerade" [Allocation of micro series: VW XL1 draws fans to finish line]. Automobilwoche (in German). Retrieved 26 October 2013. ^ Michael Harley (1 October 2012). "2014 Porsche 918 Spyder". Autoblog.com. Retrieved 14 October 2012. ^ "VW HR chief says expects five-digit number of job cuts: FAZ". Reuters. 29 October 2016. Retrieved 1 November 2016. ^ "VW-Personalchef: Elektromobilität wird Zehntausende Jobs kosten". Frankfurter Allgemeine Zeitung. 28 October 2016. Retrieved 1 November 2016. ^ "Osterloh besteht auf Bau einer Batteriefabrik". Frankfurter Allgemeine Zeitung. 18 October 2016. Retrieved 1 November 2016. ^ "VW had previous run-in over 'defeat devices'". CNBC. Retrieved 18 October 2015. ^ a b Volkswagen (12 December 2010). "Volkswagen Environmental". Volkswagen. Archived from the original on 26 February 2011. Retrieved 12 December 2010. ^ "Volkswagen. The Dark Side". Greenpeace. Retrieved 31 March 2012. ^ "The most fuel efficient car in the world: Volkswagen XL1 does 300 MILES to the gallon (and it looks cool too)". Daily Mail. 16 January 2014. Retrieved 21 February 2015. ^ "2014 Volkswagen XL1 First Drive". Automobile. 20 May 2013. Retrieved 22 September 2015. ^ "Auto expert: 'A conscious breach of US law'". Deutsche Welle. 21 September 2015. ^ "Green Car Congress: EPA and California ARB charge Volkswagen with using software defeat device to circumvent NOx testing in 4-cylinder 2.0L dieselss". Greencarcongress.com. Retrieved 24 July 2017. ^ "VW, Audi Cited by EPA for Cheating on Diesel Emissions Tests". Retrieved 26 September 2015. ^ Ewing, Jack (22 September 2015). "Volkswagen Says 11 Million Cars Worldwide Are Affected in Diesel Deception". The New York Times. ^ Davenport, Coral; Ewing, Jack (18 September 2015). "VW Is Said to Cheat on Diesel Emissions; U.S. Orders Big Recall". The New York Times. Retrieved 18 September 2015. ^ Michael Lewis (28 June 2016). "Volkswagen agrees to landmark $15.3-billion emissions settlement in U.S." Toronto Star. Retrieved 24 July 2017. ^ Thompson, Gregory J.; Carder, Daniel K.; Besch, Marc C.; Thiruvengadam, Arvind; Kappanna, Hemanth K. (18 September 2015). In-Use Emissions Testing of Light-Duty Diesel Vehicles in the United States (PDF) (Report). Center for Alternative Fuels, Engines and Emissions (CAFEE), University of West Virginia. Retrieved 18 September 2015. ^ Atiyeh, Clifford (18 September 2015). "Volkswagen Allegedly Openly Violated EPA Diesel Laws, Could Face Billions in Fines". Car and Driver. Retrieved 18 September 2015. ^ "WVU Center for Alternative Fuels Engines and Emissions". Cafee.wvu.edu. Retrieved 22 September 2015. ^ "VW, after a year of stonewalling, stunned U.S. regulators with confession". Autonews.com. Retrieved 24 July 2017. ^ "Volkswagen Canada halts some sales as emissions rigging scandal deepens". Canadian Broadcasting Corporation. 22 September 2015. Retrieved 22 September 2015. ^ William Boston & Sarah Sloat (22 September 2015). "Volkswagen Emissions Scandal Relates to 11 Million Cars". The Wall Street Journal. ^ "Wired's Native Ad for Volkswagen Diesel Tech Goes Missing". Advertising Age. Retrieved 24 July 2017. ^ Ballaban, Michael. "Why Did Volkswagen Delete All of Its Diesel Ads From YouTube?". Retrieved 26 September 2015. ^ "Volkswagen hires law firm that defended BP after oil spill". Automotive News. ^ "VW's 3.0-liter diesels under wider scrutiny by EPA, CARB". Autonews.com. Retrieved 24 July 2017. ^ "VW prepares to fight latest diesel cheating allegations". Autonews.com. Retrieved 24 July 2017. ^ "VW, Porsche, Audi 3.0-liter diesels also have 'defeat devices,' EPA sayss". Autonews.com. Retrieved 24 July 2017. ^ Spector, Mike; Boston, William (4 November 2015). "EPA, Volkswagen Spar Over New Emissions Claims". The Wall Street Journal. ^ "Audi, Porsche, VW Diesel Stop-Sale Orders: More Cars Than EPA Named". Greencarreports.com. Retrieved 24 July 2017. ^ "VW's U.S. arm sued by FTC over 'clean diesel' ads". Autonews.com. Retrieved 24 July 2017. ^ "Volkswagen Is Said to Be Cutting 30,000 Jobs". Fortune. 18 November 2016. Retrieved 18 November 2016. ^ DAVID McHUGH. "VW Betting on New Technology" Associated Press, 22 November 2016. ^ "VW to Withdraw from U.S. Diesel Market". Handelsblatt Global Edition. Retrieved 22 November 2016. ^ Ewing, Hiroko Tabuchi, Jack; Apuzzo, Matt (11 January 2017). "Six Volkswagen Executives Charged in Emissions Scandal". The New York Times. Retrieved 11 January 2017. ^ Shepardson, David. "U.S. indicts six as Volkswagen agrees to $4.3 billion diesel settlement". Reuters UK. Retrieved 11 January 2017. ^ "Judge denies bail for indicted Volkswagen executive". Associated Press. 12 January 2017. Archived from the original on 13 January 2017. Retrieved 12 January 2017. ^ "U.S. judge orders Volkswagen executive detained". Reuters. 12 January 2017. Retrieved 12 January 2017. ^ "Senior VW managers warned not to travel to U.S.: sources". Reuters. 13 January 2017. Retrieved 13 January 2017. ^ "U.S. judge approves Volkswagen dealers $1.2 billion settlement". Reuters. 24 January 2017. Retrieved 24 January 2017. ^ Cobb, James G. (24 December 1999). "This Just In: Model T Gets Award". The New York Times. ^ Mike Millikin (13 November 2014). "Volkswagen Golf family named '2015 Motor Trend Car of the Year'". Green Car Congress. Retrieved 15 November 2014. ^ "South African Formula Vee History". Formulaveesa.org.za. 17 May 2009. Archived from the original on 24 January 2006. Retrieved 27 September 2010. 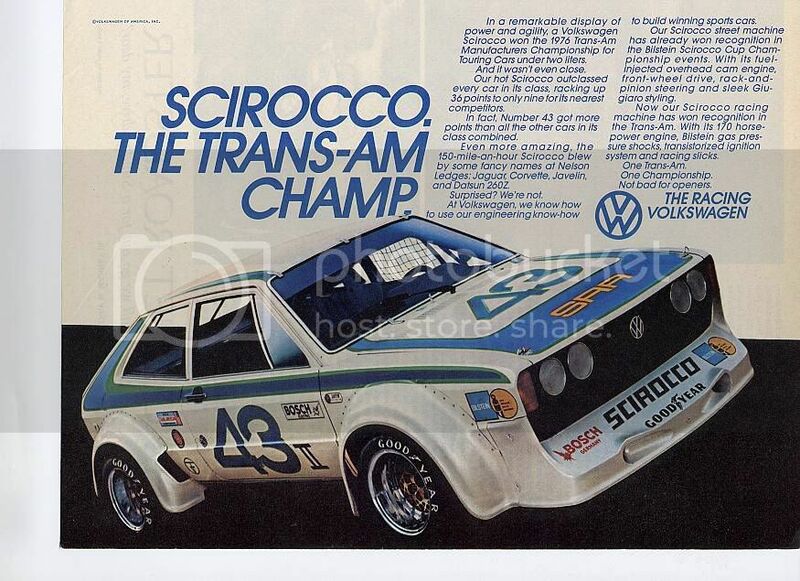 ^ "Scirocco Trans Am Article/Advert". Retrieved 27 September 2010. ^ "Twenty two drivers qualify for 2010 Volkswagen Jetta TDI Cup final driver selection event". VW.com. Archived from the original on 26 August 2010. Retrieved 22 December 2009. 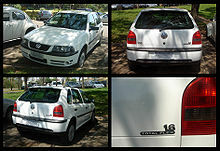 Wikimedia Commons has media related to Volkswagen and Volkswagen vehicles. This page was last edited on 11 April 2019, at 01:53 (UTC).